If you own a woodland, you are more likely to have a stronger sense of purpose and feel generally happier than the average person. A recent survey by Woodlands.co.uk found that compared with the UK average population, woodland owners experience greater satisfaction with life and feel more positive that they are doing something worthwhile. Owners were also asked to describe how others benefit from regular visits to their wood. They emphasised the woods’ positive impact on their children and grandchildren. According to owners, woods give children freedom to explore and discover without being constantly watched. 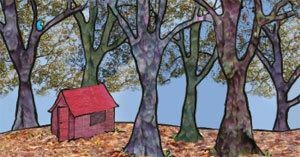 Also, woods offer a sensory-rich environment away from screens where children can learn and have fun for hours on end. Parents and grandparents felt that in a wood, children connect with nature and engage with their fantasy of their wild wood stories. The survey findings bring fresh evidence to the body of research over 20 years showing the link between trees and people’s mental health and wellbeing. Woodlands.co.uk want to see more trees planted in urban environments. Another key recommendation from their report is encouraging regular visits to woodlands by all, and especially, by children. Woodland.co.uk’s survey replicated the UK government’s recently introduced research methodology to assess people’s sense of wellbeing across the nation. Woodlands.co.uk’s survey was carried out in February 2012 among adult members of the Small Woodlands Owners Group in the South East of England as well as general enquirers to Woodlands.co.uk. Woodlands.co.uk is a family business set up twenty years ago. Since then, Woodlands.co.uk has created and sold over 1,200 small woods all over Britain with the help and support of their local managers. All the Woodlands.co.uk team are passionate about woodlands and want to see them go to owners who will preserve their woods as much as they enjoy them. 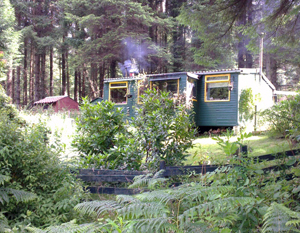 Huts and hutting in Scottish Woodlands – time for change?